‘Unheard’ victims of the Troubles and those who do not support the Peace Process will be among those targeted in a new project being developed for Derry & Strabane. Local organisation Towards Healing and Understanding, based at the Junction on Bishop Street, is set to deliver the EU-funded Unheard Voices Programme. The project forms part of Derry City & Strabane District Council Peace IV Programme, following a draft letter of offer of £6,122,713 from the EU. 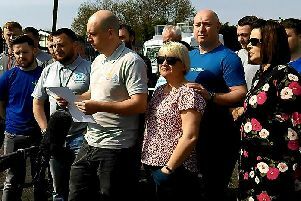 The Peace IV Unheard Voices Programme is part of the ‘Building Positive Relations’ workplan and maximum budget of £158,000 was set aside for the project. Kevin O’Connor, Council’s Head of Business, delivered a report to Councillors sitting on the Business & Culture Committee on Tuesday afternoon. The report stated: “This initiative is a key council Peace IV programme for working with victims/survivors and those most impacted directly and indirectly by the ‘Troubles’ and its legacy. It will design and deliver programmes to create space for those ‘unheard’ victims of the Troubles who do not feel they have yet had adequate opportunity to find their voice. Engaging with such a wide range of people requires flexibility due to the “high level of reconciliation challenge”, particularly in relation to dissenting voices, the report stated. Towards Healing and Understanding’s bid was supported by a range of organisations including Reach Across, Wave Trauma Centre, Affirm NI, Parish of St. Mary’s (Creggan), Ulster University (Psychology Research Institute) and Foyle Women’s Information Network. Contracts will not be signed until a full letter of offer has been received from the Special EU Programmes Body and official ‘Permission to start’ has been awarded, the Committee was told. Councillors backed a recommendation that Towards Understanding and Healing be awarded the tender. Sinn Fein Councillor Kieran McGuire sought assurances over how the project would reach all those ‘unheard voices’ and make sure they were heard. Mr O’Connor said that they would feed those thoughts back to the provider, while adding that efforts would be made to include people across all areas of the Council region.